One of the invasive Indo-Pacific lionfish run to ground in last spring’s Hunting of the Lionfish. Animal rights activists converged on Blacktip Island Friday to protest the Caribbean island’s traditional spring Hunting of the Lionfish. 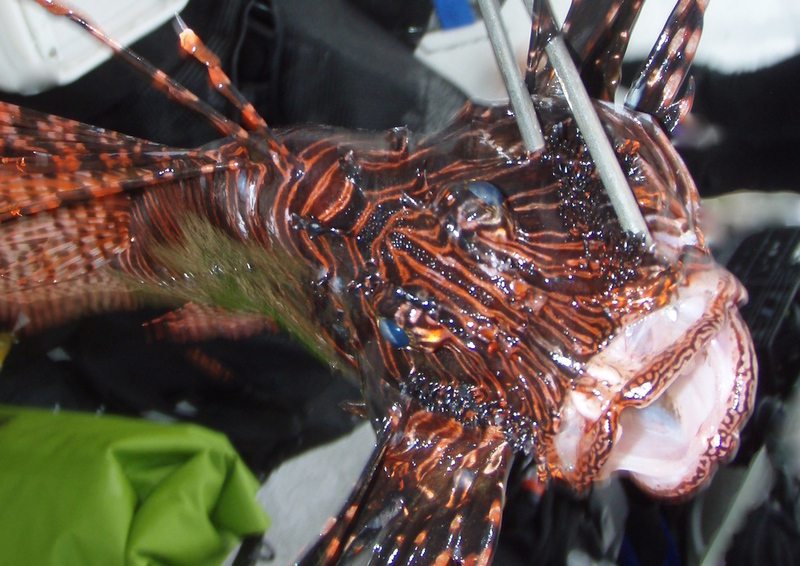 Hunt organizers rushed to defend the Hunt as a means to combat the invasive red lionfish that have overwhelmed Blacktip Island’s reefs. “The Hunt maximizes limited resources,” said Red Reynard, the Hunt’s Master of the Grouper. “There were too many lionfish and not enough divers, or bottom time, to keep them in check. The use of grouper draws the most criticism. “Proper wildlife management procedure is to simply spear the lionfish, one by one, not chase them across the reef and let big fish tear them to shreds,” PETA’s Pickett said. Other opponents leveled harsher criticism. Island authorities are urging caution from protestors and hunters after an attempt to disrupt last year’s hunt went awry. “The SPCP people dressed as lionfish, rubbed fish guts all over themselves, then scuba dived through the middle of the chase,” Island Police Constable Rafe Marquette said. “It was mayhem, with chunks of flesh and lionfish costume flying everywhere.